The site was part of a tract called “The Rock of Dumbarton” patented 1703 by Ninian Beall. The house was probably started 1799 by Samuel Jackson. It was completed 1805 by Joseph Nourse, first Registrar of the Treasury. 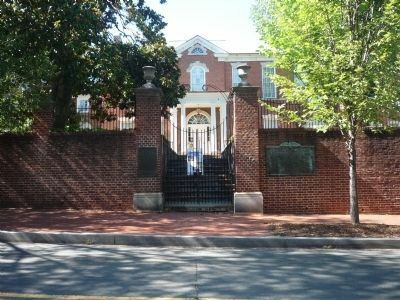 He sold the property 1813 to Charles Carroll who named it “Bellevue.” Purchased by this Society 1928, it was restored to the early Federal period, renamed; and opened to the public 1932. The house formerly blocked Q Street and was moved to its present location, 1915. Erected 1951 by National Society of Colonial Dames of America in the District of Columbia. - marker visible on left. - mid-way between 27th and 28th Streets. Marker is at or near this postal address: 2715 Q Street, NW, Washington DC 20007, United States of America. Touch for directions. Other nearby markers. At least 8 other markers are within walking distance of this marker. Georgetown Refuge (within shouting distance of this marker); Herring Hill (about 400 feet away, measured in a direct line); Evermay (about 600 feet away); Margaret Peters and Roumania Peters Walker (approx. 0.2 miles away); Lillie Mackall (approx. 0.2 miles away); Rose Park Recreation Center (approx. 0.2 miles away); Mt. Zion United Methodist Church Parsonage (approx. 0.2 miles away); First Baptist Church, Georgetown (approx. 0.2 miles away). Touch for a list and map of all markers in Georgetown. Additional keywords. U.S. Constitution Bicentinnial. 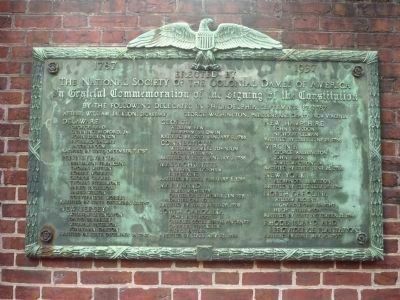 "Erected by the National Society of the Colonial Dames of America in Grateful Commemoration of the Signing of the Constitution, 1787-1937, by the following delegates in Philadelphia, September 17, 1787: ... [lists of delegates and officers]" on the wall, east side of gateway. More. 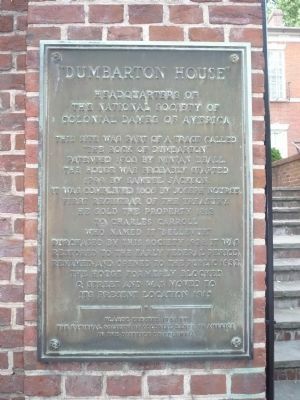 Search the internet for Dumbarton House. Credits. This page was last revised on July 19, 2016. This page originally submitted on July 31, 2010, by Richard E. Miller of Oxon Hill, Maryland. This page has been viewed 902 times since then and 13 times this year. Last updated on July 13, 2016, by Jaclyn Brown of Washington, District of Columbia. Photos: 1, 2, 3. submitted on July 31, 2010, by Richard E. Miller of Oxon Hill, Maryland. • Kevin W. was the editor who published this page.